April 10, 2015. Digital mapping is uniquely suited to documenting human rights abuses because the human eye is drawn to images. Moreover, human rights abuses are inherently linked to geographical context. Working with Christoph Koettl of Amnesty International, I helped create a new website, Human Rights Mapping, which presents and explains the variety of online mapping resources that researchers, activists, and others may use to support human rights work. Crowdsourced Maps are created using information that the public contributes. Story Maps typically tell a story that is geographically linked by various present-day pieces of the story as the viewer navigates through the map on a predetermined path. Rapid Response Maps are quick and easy to make for situations where dissemination of information is time sensitive. This type of map can involve a social media component. Data Visualizations are typically online and allow the user explore the data at different zoom levels, times, and with different attributes that can be turned on or off depending on the map’s settings. Static Maps are not interactive. They present data in a preset way that allows the person making the map to choose what geographic areas and attributes the map focuses on. Screenshot of an Amnesty International story map showing their recent research on airstrikes in Al-Raaqa, Syria. A good map summarizes large amounts of information in a way that attracts the viewer’s attention and promotes engagement. Data visualizations and static maps each do this in their own ways. Data visualizations can change as time progresses and facilitate the user’s ability to develop their own understanding by focusing on parts of the map that interest them. If there is a specific aspect of the data the researcher wants to emphasize, static maps often work best. Many of the tools used for creating static maps can also edit spatial data and perform spatial analyses. Two components essential to combating human rights abuses are (1) learning about the locations where abuses take place, and (2) generating enough engagement to trigger change. Crowdsourced maps contribute to the first objective, providing a way for witnesses to report their knowledge of local conditions anonymously. Rapid response maps can be generated to build engagement quickly around a breaking news event or to quickly document a protest. Story maps, as the name indicates, provide a narrative linked to specific locations. Many of the tools featured on the Human Rights Mapping site allow those creating a particular map to choose locations and time periods and then present information in the form of text, pictures and video. The Human Rights Mapping website grew out Health and Human Rights, a graduate course at the Harvard T. H. Chan School of Public Heath which pairs students with an organization or individual to work on a project outside of the classroom. As a former geography major now participating in the school’s Humanitarian Studies, Ethics, and Human Rights concentration, I was drawn to the work of Christoph Koettl, who uses satellite imagery and mapping to support documentation and advocacy around human rights. Koettl’s work includes mapping airstrikes in Al-Raqqa, Syria (2015) and using mapping to explain the continued growth of North Korean prison camps (2013). Through his work, Koettl had seen the impact of human rights mapping but noticed a lack of information and guidance about effective tools that human rights researchers and activists could use to develop their own maps. Together we created this free, web-based resource. According to Amnesty International, 131 nations — 82 percent of the world’s countries — tortured their citizens in 2014, and 58 percent conducted unfair trials. These figures have risen significantly in the last two years. To combat this rising tide, new tactics must be adopted. 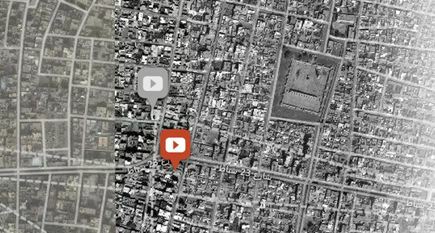 When used responsibly, the merging of mapping and human rights presents a tremendous new opportunity to document and communicate information about human rights abuses occurring around the world. As with any form of human rights research, it is important to make sure that the information collected be gathered with the greatest care, so that it cannot be used against those from whom it was collected. Ariel Low is a Master of Science in Public Health candidate in the Department of Global Health and Population at Harvard T.H. Chan School of Public Health.